Sully is an excellent movie based on the emergency water landing of US Airways Flight 1549 piloted by Captain Sullenberger, aka Sully. After losing both engines due to a bird strike, there was little time to decide the best course of action. As you will see in the movie, there were many people in authority who criticized and tried to second guess Sully's decisions. However, at that most difficult moment, Captain Sullenberger made a judgement call that saved the lives of all 155 souls on the flight, as well as countless others on the ground. Few movies that are based on actual events honestly present the facts as they actually happened. Most directors take a poetic license to "grow" the characters or add to the drama. However, in the case of "Sully", there was no reason to inflate the character of the man. Nor was there any reason to increase the drama surrounding the flight crew and passengers on that plane that day. This movie deserves more than applause and awards for the portrayal of actual details and accounts of the actions taken that day by the entire crew and rescue workers who immediately responded. It also shows the stress and judgement the crew members were forced to endure as their decisions were probed and analyzed by a board of individuals safely sitting on the ground. Clint Eastwood has always been one of my favorite actors, however he excels even beyond those expectations as a director. 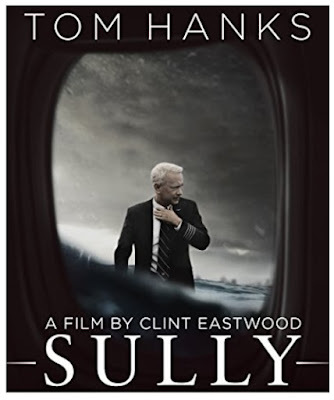 Paired with an outstanding performance by Tom Hanks, who plays Sully, this movie stands heads above any other drama I have ever seen or reviewed. SullyThe real facts and the movie depiction are the same. On January 15, 2009, US Airways Flight 1549 departed New York's LaGuardia airport in route to Charlotte, NC. Approximately 3 minutes into the flight, the plane struck a flock of Canadian Geese causing both engines to fail. It is the only time in aviation history that there has ever been a duel engine failure on a passenger carrier caused by external factors. An emergency landing was imperative, but there were no obvious options for a safe landing. While receiving rerouting suggestions for a runway landing at nearby airports from air traffic control, Captain Sullenberger and First Officer Jeffrey Skiles made a cool headed and well considered decision to land the plane in the Hudson River near boating terminals. In an amazing, unprecedented glide landing on water, Sully landed the A320 jet, and the crew started an immediately evacuation of the passengers. Also accurately depicted in the movie and almost as unbelievable as the safe water landing, NY Waterway ferry Thomas Jefferson, commanded by Captain Vincent Lombardi arrived to help with evacuation 4 minutes after the plane landed. It was followed by several other boats, rescue divers, and emergency response teams who were all ready and willing to help save lives. The fact that all passengers and crew members survived truly was a "Miracle on the Hudson". Many of us saw the news reports and watched the miraculous rescue in real life, but the movie fills in the blanks. It shows us something there was no way we could see on Jan. 15th or the following days. It gives us a front row seat to how heroes are revealed. We witness what will most likely be the last 3 minutes of the lives on-board that plane. We watch the excruciating agony of the helpless on the ground through the eyes of the air traffic controllers. We quickly realize the horror that New Yorker's are once again being forced to watch unfold. Staring out the cockpit windows of the fast approaching freezing cold water, we find ourselves bracing for impact. Then in a few brief moments, pulling from all previous flying experiences and training, an extraordinary pilot does the improbable. He safely lands the jet on water. The crew oversees the evacuation and Sully, himself, walks the length of the plane to ensure all of the passengers are out before he will step outside of the plane. It is clear that his first concern before he lands the plane and afterwards was for the safety of the passengers of Flight 1549. Now, you think that is all of the story, but it is not! All aviation accidents are investigated. Determining who or what is at fault becomes the focus. Not that the pilot and crew saved lives by their actions, but whether or not those actions are considered "appropriate". This is the part of the story most didn't know until they see the movie. After you see the movie or read the book, I would love for you to return and tell me how you felt, what you thought, how you would like to respond. Personally, I have a renewed admiration for the pilots of all aircrafts and their determination to succeed in that industry. I'm going to close by saying something I have never said in a review before. If you haven't seen this movie yet, go! okay, I will go see it, despite the fact that I have never been a fan of Tom Hanks. But I do like Clint Eastwood's directing and the movie sounds intriguing. I remember when Sully did the landing so it will be good to see the behind the scenes drama. I've been seeing the promos for this movie for a couple weeks now, so have already been looking forward to seeing it. Your excellent review has whet my appetite even more now. Can't wait to see it. I like both Tom Hanks' acting (Captain Phillips is a favorite) and Clint Eastwood's directing (he is phenomenal). I've also admired the man everyone now knows as Sully that I've seen in TV interviews and the like; clearly he is a man of character who never expected to become a hero. I knew that there was some conflict in the aftermath of the investigation, but I don't know a lot about that so I'm looking forward to learning more from the movie. It's good to hear from you, Cynthia, that the facts are reported accurately. Thank you for the excellent movie review. I followed the plane crash stories when it happened. But now am very interested in the pilot and crew insider info. This movie, Sully, sounds like a great way to do that. Thanks for such a heartfelt review. Well you've convinced me with your edge-of-the-seat movie review. Though I'm not sure when we'll get to it, I am definitely more interested now. Thanks! I don't see many movies, but your review has made me want to see this one. Great job! I can't wait to see this. My kind of movie. Excellent review.